A plan for every day of the trip. It’s now Monday and it’s back to work today. Made it home at 8pm on Saturday, had a great welcome home by my friends and family. The car is now stranded outside the house with a faulty alternator, any one wishing to donate a new one would assure the future of the astra, otherwise, not clear what to do with the old girl. The fund on just giving is up to £720 and I have a good amount on my sponsor forms. Should push it over the grand target. Not clear if i will blog on this one again, it’s job done for arctic circle challenge and back to the old routine in Monty and Stadco. A big thank you to all those who donated to the hope house and sent me encouraging messages. Thanks in particular to Elaine for her support and to Clive my co-driver, I could not have done it with out you. When we get back into Britain, we head for Colchester to Re-Cycle where we drop off the old bike that has not been called into action as back up transport during this trip. 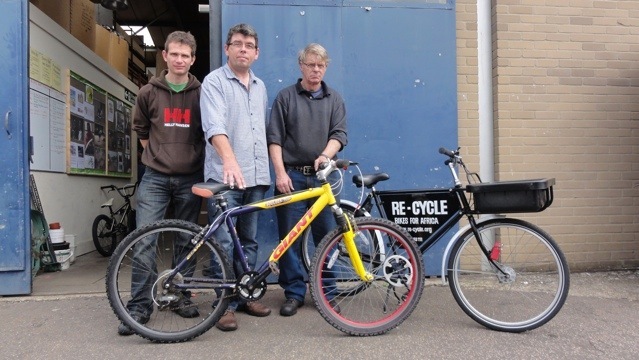 Re-Cycle refurbish old bikes and send them out to third world flurries to be used as basic transport. I am hoping to pop in to see a friend in Coventry for a brew before heading back to Monty. By the time we get home tomorrow, we will have done around 4500 miles, not exactly clear how much as the speedo packed up on the way to the Atlantic road, I will work it out on google maps. Are both tired now, waiting at the ferry terminal to board. It’s a lovely day and the sea looks flat. Last night I happened to mention to the captain in passing that Clive and I were both engineers and would love to see the engine room, He suggest we call by at the reception at 10am and he would see what could be done. He came up trumps and we were met by One of the engineering support crew and taken to meet the second engineer who gave us a guided tour. Explained all the monitoring systems used on the engines to give them advanced warnings of any problems, several sensors are positioned on each of the nine cylinders, they monitor temperature. Three sensors fitted to each cylinder, have a read out on a large monitor, if they warn of a problem, cooling flow can be altered or if the piston is deemed faulty, it can be changed while the back up engine is used. The engines deliver 15000 kw each, they turn at 490 rpm and run on heavy oil that has to be heated up to 150 degrees C to allow it to be injected. The heat from the exhaust is used for water and space heating. each engine has a turbo charger. The engineers work on a 14 days on 14 days off rotor and between 11 and 13 hours per day. The engine room is very hot, it is very noisy and I think while an interesting job, it must be fairly demanding. what struck me was that the engineers was very similar to any of our maintenance fitter in Stadco, The work shop was the same and they had similar preventative maintenance systems and even could propose improvements to hardware if they can demonstrate a saving over time, usually in fuel consumption. We had a great trip down to the engine room, thanks very much for the visit to the engine room on Dana Serina. E burger joints don’t do veggy, we ended up on a scottish bar, where an American sand Irish songs, he was ok but with exception of the tartan wall paper, the connection with Scotland was poor, I knew something was wrong when t here was no haggis on the menu, let alone deep fried mars bars, and the selection of whiskey, mostly Irish and American bourbon was no better than you could have bought in any UK spar. We didn’t stop long. 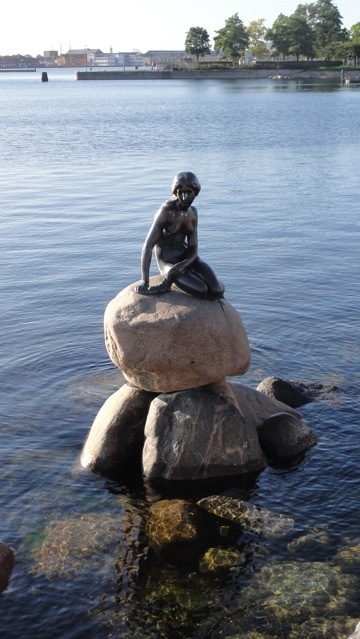 I would like to come back to copenhagen one day. After the two runs through the leardal tunnel, what a trip, we set off for Oslo which was five miles short of two hundred miles and it was dark, and chuckin it down, not the sort of night to drive 200 miles. After about 50miles and realising that the astra head lights were pointing the wrong direction we exited road left into a farm yard with a Wendy house sign. The farmer and his wife came to the door and greeted us and showed us to the chalet. They were lovely friendly people and they spoke good English. It was a bit dearer than last nigh but it was worth it, it was palatial in comparison to last night, we had a bedroom each, I had a four poster bed, unlike last nights this one was not supporting a bed above it, Clive had a really nice big room, the kitchen had hot and cold water, a fridge, a cooker and all the kit you might need.it was perfect. I managed to lash up some sort of charger for the camera battery which was now nearly flat, I had been really limiting how much I used it all day so I could get all the good bits filmed. Astra is getting tired of this trip now, she needs a rest but we still have nearly a thousand miles to go in the last couple of days before we get back to Monty.